The Wine Battle takes place in Los Riscos de Bilibio, where the Hermitage of San Felices is located. Thousand of people meet together to take part in this international WINE BATTLE, where all kinds of recipients are used for hurling wine at the opponents. At the foot of the cliffs where the hermitage is located and after mass is celebrated, the battle takes place. Take care, you may think you are safe, but no place is entirely safe here. A lesser-known battle takes place two days earlier. It is the Wine Battle for children. Here only grape-juice is used. 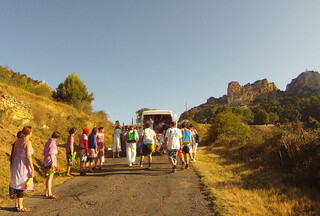 With the construction of the Hermitage in the XVIII century, the pilgrimages and the processions in honour of Saint Felices started to be more organized. There was already at that time a mass celebrated every 29th of June, being followed by an outdoor meal with food and drink, where jokes and port wine stains on the pilgrims’ cloth became a feature of this meal. This seems to be the origin of this festivity, which can still be enjoyed each year on the same day. Dress in white, tie a red scarf around your neck and launch yourself into the battle. In case you are more sensitive than others to cold weather, wear a raincoat under your white clothes or wrap yourself in film. That is how locals fight off the cold.